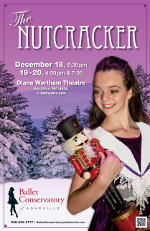 Join us December 18 at 6:30 and December 19 & 20 at 4:30 & 7:30 for BCA's holiday classic The Nutcracker. Featuring Blair Chamberlain as the Sugar Plum Fairy, Sarah London as the Dew Drop Fairy, Christopher Lynn as the mysterious Herr Drosselmeyer and talented dancers from our Pre-Professional division -- including Avery Sund as Clara -- this holiday classic includes over 100 performers, lavish sets and costumes, and timeless favorites like Waltz of the Flowers. There's even a classic battle between an army of Mice & Soldiers! Don't miss Clara's timeless adventures in a world of magic and beauty, a perfect holiday treat for the entire family. Tickets range from $12 to $25 and go fast -- call Diana Wortham Theatre at (828) 257-4530 or visit dwtheatre.com to reserve your tickets today. Download the Nutcracker 2013 program.